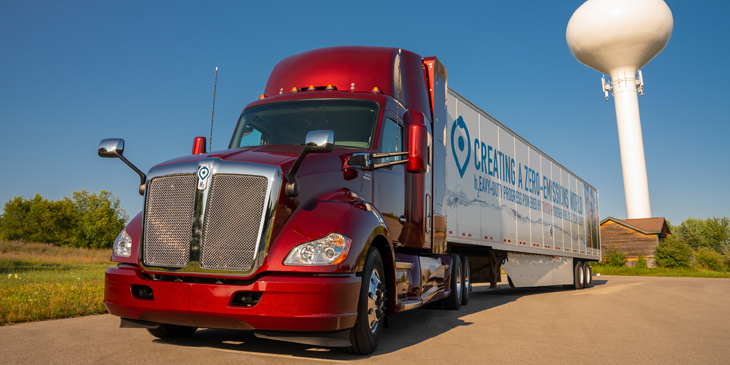 At the recent prestigious Center for Automotive Research (CAR) Management Briefing Seminars in Northern Michigan, Toyota announced the next great leap towards the future of zero-emission trucking by unveiling the second iteration of its Project Portal hydrogen fuel cell electric Class 8 truck. The new ‘Beta’ truck significantly exceeds the capabilities of the ‘Alpha’ demonstrator vehicle revealed in 2017, increasing the estimated range to more than 300 miles per fill. The truck also enhances versatility and manoeuvrability with the addition of a sleeper cab and a unique fuel cabinet combination that further increases cab space without increasing wheelbase. For both the Beta and its predecessor Alpha vehicle, Ricardo assisted Toyota with a wide range of engineering functions. These included systems integration and packaging, including the fuel cells, power electronics, hydrogen tanks, cooling systems, batteries, electric motors and transmission. Many of the ancillary systems that are traditionally driven by the engine were also electrified, including the air compressor, power steering and HVAC system, the controls of which required integration into the vehicle’s J1939 CAN BUS. Crucially, both the Alpha and Beta vehicles were constructed by Ricardo at the workshops of its Detroit Technology Campus located at Belleville, Michigan. With a gross combined weight capacity of 80,000 lbs, the 670-plus horsepower Alpha truck produced 1325 pound-feet of torque from two Mirai fuel cell stacks and 12kWh of battery. The Project Portal Beta vehicle maintains these torque and horsepower numbers while also extending the range of the vehicle by 50 percent to in excess of 300 miles between hydrogen refills.